Fifty years ago a British film challenged widespread views on homosexuality and helped to change the law. 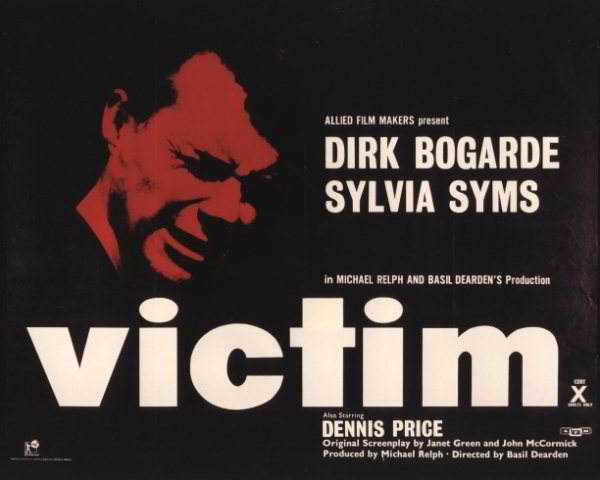 Andrew Roberts looks at the enduring impact of Basil Dearden’s Victim. In late 1960, what appeared to be a run-of-the-mill British crime film, complete with trilby-hatted detectives in their bell-clanging Wolseley police cars roaming a bomb-scarred London, went into production. The casting seemed notably deluxe for such a seemingly mainstream enterprise, but on its release in 1961 Victim became one of the few pictures to genuinely shift social attitudes. That same year saw the cause célèbre of the John Gielgud case, in which the recently knighted actor was arrested by the Metropolitan Police for ‘cottaging’. Despite the fact that the actor gave a false name and occupation to the magistrates’ court - ‘Arthur Gielgud, a £20 per week clerk’ – and was fined a nominal £10, the press soon acquired the story. Then, on the August Bank Holiday of 1953, Edward Montagu and the film director Kenneth Hume took two boy scouts to a beach hut at Beaulieu for a bathe, where a stolen camera was subsequently reported by Montagu to Hampshire Constabulary. However, the boys claimed that they had been indecently assaulted and Montagu was charged by the police with both committing an unnatural offence and an indecent assault. At his trial Montagu was acquitted of committing an unnatural offence but the jury disagreed on the lesser charge and the DPP decided that Montagu and Hume should be tried again for indecent assault. Three weeks later Michael Pitt-Rivers, a cousin of Montagu, and Peter Wildeblood, a journalist, were also arrested and their premises were searched without a warrant prior to their being charged with indecency against two RAF servicemen in a beach hut at the Pitt-Rivers estate in Dorset. Not all of the press coverage of the Montagu affair was unsympathetic and some journalists detailed the dubious methods of Hampshire police in their quest for evidence. A month after the Montagu trial David Maxwell-Fyffe, the home secretary, agreed to the appointment of a departmental committee to examine and report on the laws relating to homosexuality, chaired by Sir John Wolfenden, the former headmaster of Uppingham and Shrewsbury public schools and then vice-chancellor of Reading University. The committee deliberated over a period of three years and in the Report of the Departmental Committee on Homosexual Offences and Prostitution, published on September 3rd, 1957, concluded that ‘homosexuality cannot legitimately be regarded as a disease, because in many cases it is the only symptom and is compatible with full mental health in other respects. It is not, in our view, the function of the law to intervene in the private life of citizens, or to seek to enforce any particular pattern of behaviour’. In short the committee considered that homosexuality should be treated on a par with other forms of sexual behaviour that, although viewed as repugnant by some, were not proscribed by law. Meanwhile the British film industry was heading towards one of its regular crises; by 1957 television had overtaken radio in terms of popularity and cinemas were closing at a rate of knots. When the former school teacher John Trevelyan was appointed secretary to the British Board of Film Censorship (BBFC) in 1958 he was facing both a declining film industry and an acceptance that ‘The main thing is that people’s ideas have changed’. Ten years earlier Trevelyan’s predecessor had laid down the threefold criteria for film censorship: was the story, incident or dialogue likely to impair the moral standards of the public by extenuating vice or crime or depreciating moral standards; was it likely to give offence to reasonably minded cinema audiences; and what effect would it have on children. It was the release in 1959 of Room at the Top, based on John Braine’s gritty novel, that established the idea that X films could encompass commercially and critically successful ‘adult dramas’. Unlike British theatre, where the Lord Chamberlain’s censorship policy had banned plays with a ‘homosexual theme’ until 1957, there was never any explicit bar to films tacking the subject but initially Trevelyan was wary: ‘Until it becomes a subject that can be mentioned without causing offence, it will be banned’. However by 1959 the BBFC did pass, albeit with an X certificate, Serious Charge, which concerned a teddy boy falsely accusing a vicar of molesting him. The following year saw two further breakthroughs with separate portrayals of Oscar Wilde by Robert Morley and Peter Finch. These developments inspired the film producer Michael Relph’s plans for a picture with ‘... the same point of view as the Wolfenden Report, that the law should be changed ... The film shows that homosexuality may be found in otherwise completely responsible citizens in every strata of society’. Relph and his directing partner Basil Dearden had recently made Sapphire, a brave if not wholly successful attempt to tackle racial prejudice on screen, and for their next ‘social conscience film’ they showed the censor their plans for a film concerning an apparently successful, happily married barrister who is a covert homosexual. When his ‘boyfriend’ commits suicide he attempts to uncover the blackmail ring that led to the young man’s death. When Trevelyan was shown a draft script in early 1960 he realised that there was a wealth of difference between the depictions of a genuine historical figure who had been dead for nearly six decades and a drama centring on a ‘respectable’ character in contemporary London. ‘It would be wise to treat the subject with the greatest discretion,’ he said. Relph assured the BBFC that this would indeed be the case and filming started in the autumn of 1960. The film’s leading man was Dirk Bogarde, by now one of the most high profile actors in the United Kingdom. To satisfy the BBFC’s worries over the potentially damaging use of explicit language, the word ’queer' was sparingly used and the screenplay ensured that there was at least one sympathetic police officer in the form of John Barrie’s detective-inspector. ‘The less we have of groups of “queers” in bars, and clubs and elsewhere the better. There is plenty of scope for the police ... to let a little normality, light and shade on this very sombre world,’ advised Trevelyan. Indeed, with the exception of Bogarde’s character, virtually all the homosexuals portrayed in Victim are essentially passive. Homosexuality is seen as ‘a condition’ and although Bogarde’s Melville Farr takes an active and heroic role in uncovering the blackmail ring, Janet Green’s screenplay is at some pains to point out that although Farr has homosexual desires, he has ‘never acted on them’. Victim was released in the UK in autumn 1961 to critical plaudits. As with most of Dearden’s films it is a polished production with some of Britain’s finest character actors – Nigel Stock and Norman Bird in particular – conveying a real sense of pervading fear, but Bogarde was highly dissatisfied with the film’s original ending. In the first draft of the script Farr was to have been handed compromising photographs by the inspector and just before the final credits it was to be revealed that they showed the barrister embracing a young man. Bogarde’s own long-term relationship with his manager Tony Forwood was only vaguely alluded to in his many volumes of autobiography and the star often claimed that the film’s only gay actor was Dennis Price, whose role as a matinee idol under the constant threat of blackmail was indeed a tragic case of art imitating life.But it was Bogarde who penned the scene in which Farr screams in anguish to his wife just why he stopped seeing ‘Boy Barrett’, for one simple reason: ‘Because I wanted him!’ It was the first time such a statement had ever been uttered in any mainstream English-language film. The idea that homosexuality was an affliction would take a long time to dissipate and for the next few years the standard British cinematic viewpoint was that of A Taste of Honey (1961) and The Leather Boys (1964), where the gay characters, played by Murray Melvin and Dudley Sutton respectively, are charming, caring and intelligent yet doomed by the final reel to remain alone and isolated. But before Victim gay characters in British film were all too often comic relief figures of the prissy-camp school of cameo – one thinks of Michael Ward, Charles Hawtrey or the young Kenneth Williams. Although the film was heavily re-shaped by BBFC ‘advice’, the idea of homosexual desire had been openly stated by one of Britain’s major film stars. The door to social acceptance and understanding had been narrowly but significantly opened.